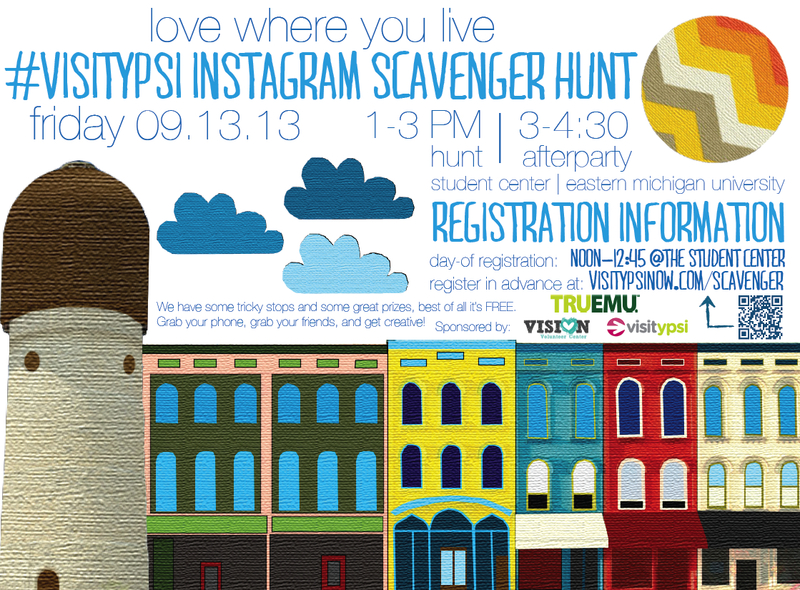 I created first #visitypsi Instagram Scavenger Hunt in conjunction with the #visitypsi Blog Writer Tour as a way to build our handle, tags, and ultimately our brand on Instagram and Facebook (@visitypsi #visitypsi). By highlighting the attractive locations and aspects of the Ypsilanti area with not-so-tricky clues, I hoped to increase the portfolio of positive images of the area in addition to increased association of our brand with positive, promotional images. The first hunt was May 18, 2013. We had approximately 20 participants in nine teams. There were 15 clues, each with an individual hashtags to keep track of the photos as they were posted. Judging happened on-scene by me and awards were given directly after the event for first place, second place, and most creative. A separate “People’s Choice” award was voted on throughout the following week via a Facebook album – the photo with the most votes at the end of the week won. Everyone was extremely happy with the set-up and excited to know when Visit Ypsi would put together the next hunt. I figured it would be an annual thing until I got a call from Eastern Michigan University a couple months later. Eastern Michigan University’s VISION office contacted me not too long after the hunt in May to see if Visit Ypsi would help them put together a scavenger hunt for incoming freshman. The second hunt took place Friday, September 13. Using basically the same format, this hunt was modified slightly to familiarize students with the Ypsilanti area and build our brand (@visitypsi #visitypsi). Approximately 30 teams participated in the EMU hunt, with an estimated 75 participants at the start of the event. I modified these photographs of the Ypsilanti area using iWork Pages and Photoshop. I created the poster in Illustrator. Overall I believe both hunts met and exceeded my goals and expectations and I look forward to refining them in 2014.